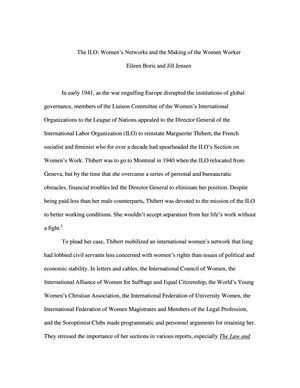 The ILO has generated a three-fold history: as an institution, as an arena of debate over women's place, and as a creator of social knowledge about the woman worker. Its reports and studies offer historians a wealth of materials through which to trace women's work over time and space, in female-dominated occupations and in "non-traditional" labor, in the home and for the family, and in the community as activists, policymakers, sojourners, residents, and citizens. Its documents, particularly those relating to the last fifty years, present a new field for research, offering material to explore transnational networks, globalization, and the interaction between the local, national, and international.